"I came across your blog when researching information regarding a specific style drum and I hope you would be so good to share any information you may have regarding such. 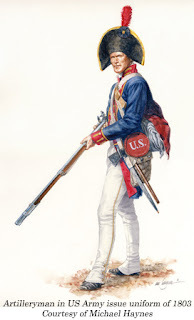 "I am trying to ascertain what colors U.S. Army regimental drums would have been painted in 1803. I have a snare drum built by Nathan Carroll which is painted in the traditional blue body with red hoops. I purchased it for the 1812 bicentennial. However, now I am researching the army during the construction of the Natchez Trace road in the old southwest territory in the early 1800's. 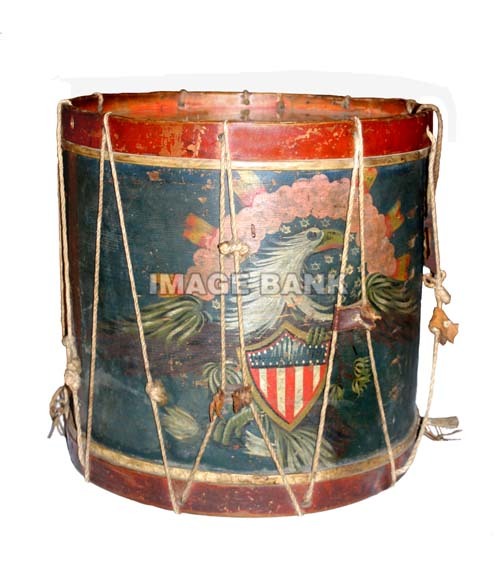 "I have read that U.S. Army military drums during the early Federal period were painted with blue hoops, blue body, and thirteen federal style stars. So, my question is... when did the color change from the "Federal style" to the red/blue combination seen during the War of 1812 period? Additionally, the book 'Tailor Made, Trail Worn' illustrated by Michael Haynes shows a Lewis & Clark ca.1804 drummer with the red/blue design although he gives very few details on the drum. He does state that the emblem design on the drum is conjectural but I don't know if the colors of the drum are conjectural as well. "If you have any information on this subject I would be greatly appreciative if you would share. Please feel free to provide any responses by way of the comment section below, or email us at BlogMaster@FieldDrums.com.